Following in Katsuaki Susa and Yasuhiro Suzuki's footsteps, another Japanese boxer showed his extreme prowess at the 16th edition of the AIBA World Championships in Baku. Asian Championship bronze medallist Ryota Murata had lost only one contest this year with most of his fights not going the distance. His only defeat coming at the hands of Uzbek boxer Shukhrat Abdullayev, eventual winner of the Asian Championships in Incheon. Murata had the opportunity to avenge this loss when he faced another Uzbek boxer, two-time AIBA World Champion and top seed Abbos Atoev, in his second contest in Baku. The scores were tied 3:3 after the first round but then the Japanese rising star rocked the Uzbek fighter in the second and again in the third forcing the referee to stop the middleweight contest with Murata leading 14:8. Short after Atoev's loss, Uzbekistan's new superpower and two-time National Champion 20-year-old Fazliddin Gaibnazarov restored pride in the Central Asian country. He demonstrated skills and magnificent technique against Chinese Taipei's Asian Championship bronze medallist, teenager Kao Chih Yuan with the referee stopping the one-sided contest in the third round with Gaibnazarov up 31:6. Ukraine's flag-bearer, Beijing Olympic Games winner and defending AIBA World Champion Vasyl Lomachenko was lightning-quick in his fight against Tonga's Commonwealth Games bronze medallist Lomalito Moala, the Moroccan referee stopping the contest in the first round. China's Asian Championship silver medallist Liu Qiang joined his national programme only this year but travelled to Baku aiming to qualify for the Olympics. The 29-year-old boxer eliminated Turkey's current European Champion and sixth (6) seed Fatih Keles after a strong showing in his fight. The final score of their battle was 16:10 in favour of Liu Qiang. Another medal contender in the lightweight category, Armenia's European Championship bronze medallist and former AIBA Cadet World Champion Vladimir Sarukhanyan also failed to reach the last 32. The Armenian boxer was beaten by 19-year-old US National Olympic Trials winner Jose Ramirez. Lithuania's secret weapon, 19-year-old Youth Olympic Games' winner Evaldas Petrauskas had great expectations in Baku but his London Olympic Games dream was left in tatters by India's Asian Championship silver medallist Jai Bhagwan who triumphed over his European rival 15:8. Petrauskas will have one last opportunity to reach the quota at the 2012 European Olympic Qualification Tournament. AIBA World Championship quarter-finalist, 21-year-old Branimir Stankovic of Serbia is back on track following his one-year long suspension. On his opening contest the Serbian lightweight boxer eliminated Moldova's teenager Dmitri Galagot 19:10 having fought a magnificent final round. Hungary's European Championship bronze medallist and Turkish Prime Ministry Tournament winner Miklos Varga is competing on his fourth AIBA World Championships and had the know-how to beat Georgia's two-time Olympian Nikoloz Izoria 16:11. Varga will now face Algeria's Abdelkader Chadi in the next round of the competition. Two big guns came head-to-head in the middleweight category in Baku, with India's Beijing Olympic Games bronze medallist Vijender Singh Kumar and Cuba's Olympic Games silver medallist Emilio Correa fighting to reach the last 32. The Cuban boxer showcased his sublime technique to eliminate his tough rival. Ukraine's middleweight favourite Ievgen Khytrov was the first to defeat a Turkmen boxer in Baku, 19-year-old Asian Championships bronze medallist Nursahat Pazzyyev. Khytrov had only a two point advantage after the second round but a dazzling final round forced the referee to stop the contest in his favour. Georgia's European Championships bronze medallist Jaba Khositashvili had a one point deficit against Thailand's 31-year-old Athens Olympic Games bronze medallist Suriya Prasathinphimai after the first round but shined in the second part of their battle and convincingly won the bout 23:11. Turkey's European Championship silver medallist Adem Kilicci defeated Germany's National Champion Stefan Hartel in a friendly encounter back in April. The German boxer however found the right tactic this time around and advanced to the last 32 after beating his powerful Turkish rival 13:10. Three-time Olympian and AIBA World Championships bronze medallist, 32-year-old Mohamed Hikal is back on track following an unsuccessful Beijing Olympic Games. He is the last African boxer to win a medal in any international competition and his target is to reach his fourth Olympic Games. 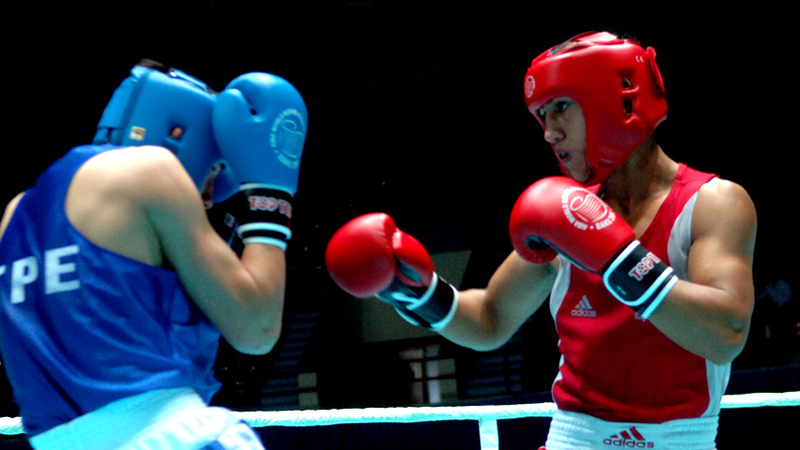 The Egyptian boxer made a successful debut against Estonia's Kaupo Arro and secured his place in the last 32. Ireland's European Championship silver medallist and southpaw boxer Darren O'Neill did not give any chance to Strandja Memorial Tournament bronze medallist Glodi Eneste of Norway, ensuring the 10-member Irish squad remain unbeaten run in Baku.